Teddy A, Nina, Cee-C and BamBam are all up for possible eviction from the Big Brother Naija house this week. The House has been a whole new world since Khloe and Anto returned. Things are getting spicier by the minute and the Nominations were no different. 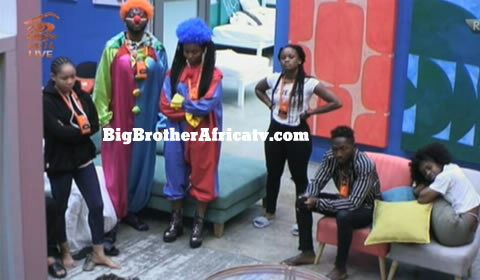 BamBam, Teddy A, Cee-C and Nina are all up for Eviction this week. Cee-C seems to of ruffled too many feathers lately as she was the Housemate who accumulated the most Nominations of them all. Now that there are so many ladies in the House, it was inevitable that some would turn on others and as Cee-C has proven that she doesn't do so well in the company of other women, it has worked to her detriment this week. Four of her five Nominations came from the other ladies in the House. The fact that BamBam and Teddy A are up for Eviction this week does not come as that much of a shock due to last week's spicy fake Nominations. Could it be their demeanour towards the other Housemates or the fact that they tend to close others off and keep to themselves a lot. Needless to say, the onetime power couple in the House have lost their armour and are now powerless to their possible fate. Nina has been safe for most of her Big Brother Naija journey, getting saved by Miracle or not getting Nominated at all but her recent actions in the House have caused many of the Housemates to think twice about her. Her tendency to play the victim and constantly bring up her age have gotten a few people irritated, or perhaps they see her as a threat. All in all it was a riveting experience all around, it is important to note that no-one Nominated the two new additions to the House and that all four that are up for Nomination have previously held quite a lot of power in the House. Oh how the tables have turned!